When you haven't chosen a piece of authentic English to explain what do you do? Listen to this programme and see if there's a phrase about taking a chance and hoping things will turn out OK.
OK, so what is this confession? Oh. Do you have any choices? Well here is the list of phrases… have a look, what do you think? Hmmm, let me see…. Shall we take 'pot luck'? 'Pot luck' – So you mean one at random and see what happens? No, I mean let's pick 'pot luck' as a phrase – look, it's there on your list. Feifei you are a genius. You have just explained an authentic English phrase – job done. Well our phrase is pot luck which describes a situation in which one must take a chance that whatever is available will prove to be good or acceptable. If you can't decide which book to pick, take pot luck, I'm sure they'll all be good to read. I'm going to take pot luck, and I'm sure the course I choose will be the right one for me. So if you take pot luck at something, you take a chance that whatever is available will prove to be good or acceptable. It's a bit like presenting this programme with you Rob! Not exactly Feifei – I am the only presenter available so you don't get any choice about who you present with – there is no luck involved. True – that's not pot luck, that's bad luck – is that on your list of phrases? 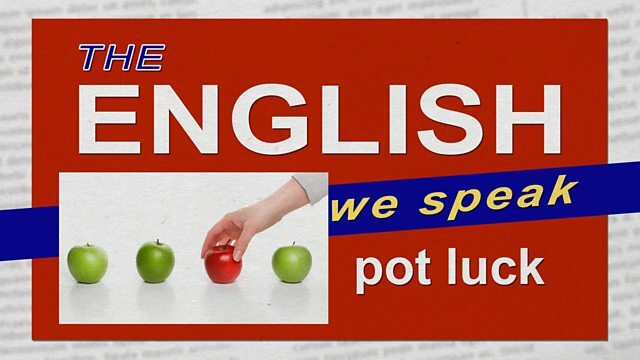 Let me have a look… no, but next time let's choose our English phrase before we come to the studio so we won't be taking pot luck anymore.